We all experience common symptoms such as muscle aches, joint pain, exhaustion, and other bothersome conditions. Often, these can be attributed to lack of exercise, interrupted sleep, depression, or other conditions diagnosed by a doctor. Usually, these symptoms can be alleviated with NSAIDs, a change in diet, or prescribed medication. Unfortunately, many people suffer from chronic pain, memory issues, extreme exhaustion, and other symptoms daily without being able to receive a diagnosis. The pain is very real for those who suffer, but causes for the pain do not appear on tests, such as MRI or blood test. This is what it is like to live with fibromyalgia. A myriad of symptoms can accompany fibromyalgia such as memory loss, IBS, GERD, chronic fatigue, headaches, depression, tender points, and anxiety. Because many other conditions can cause these issues, doctors must first rule them our before continuing with a diagnosis of fibromyalgia. One symptom that accompanies all diagnoses, however, is chronic pain. In order to make a diagnosis of fibromyalgia, patients must satisfy two important criteria. The first is to report pain in all four quadrants of the body (left and ride side, and above and below the waist) for more than three months. Along with this, a patient must have tenderness or pain in 11 out of 18 tender spots. These tender spots can be found on the front and back of the neck, knees, hips, elbows, shoulders, chest, and upper buttocks. These areas are painful when pressed to a fibromyalgia sufferer. While the pain of a fibromyalgia sufferer has been described as a head to toe throbbing, stabbing, shooting, and aching deep within the joints and muscles. Movement causes more pain, which leads the suffer to minimize movement, which in turn can cause the symptoms to become more severe. Fatigue can be so devastating that even “normal” day to day tasks, such as washing dishes, doing laundry, or cooking can feel overwhelming as the pain and fatigue set in. Because the symptoms of fibromyalgia are unique to each person, may sufferers find lack of empathy for their condition because they do not “look” sick. Friends and family may advise more rest of fatigue and exhaustion, or dismiss muscle and joint pain as simply needing to get up and move around. This and the long process to receive a diagnosis can cause anxiety for the sufferer and eventually isolation. Fibromyalgia is a lifelong condition with no cure, but there are many options for pain management. 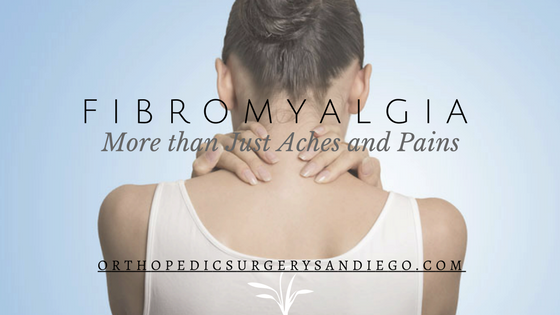 Fibromyalgia sufferers must seek the types of treatment that works best for their symptoms. OTC medications such as aspirin and NSAIDs can be used to help alleviate pain, along with antidepressants, acupuncture, tai chi, yoga, massage and physical therapy. Herbal supplements and Vitamin D help with fatigue. Cognitive behavior therapy is also used to manage negative thoughts, and give control back to the patient.